Salary negotiations start long before the first interview. Preparation is key to successful negotiations and the preparation begins as you apply for a job. Why even apply if the likelihood is low that you could make ends meet on the job? In the case study “A Friend Referred Me” we left off with some of the questions you will need to research before deciding to accept a job offer. First on the list is finding out what the job is worth. I’ll use Salary.com to research a Marketing Manager position in Boston. 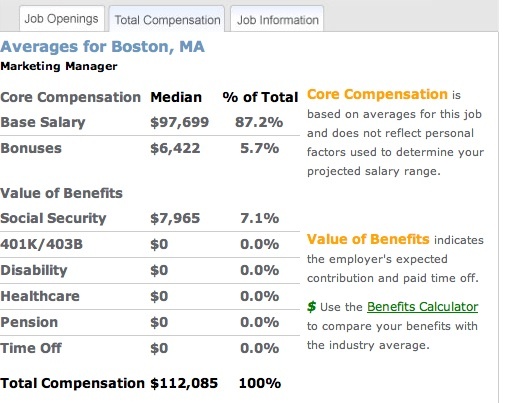 The median salary for a Marketing Manager in Boston is $97,699 according to Salary.com but that is not the complete story. There are many other variables that will affect the salary. Company size and Industry are two elements and Salary.com give you the ability to fine-tune your research. Note: there is a section about you but we will hold off discussing that section to the next post “What are you Worth? Another consideration is the job title itself. Companies try to use job titles which accurately describe the job and which are generally accepted yet some companies like to infuse their company’s personality into the job titles. So you may find yourself applying for Company Evangelist, Chief Promoter, or some other unique title. Do your best to find the best match in a salary research site to do your research. When you find the right title consider the entire compensation package and not just the salary. 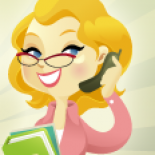 The additional detail can show you that a job typically has bonuses or commission. Since men are typically making 20+% more than women than you need to aim above the median salary and compensation package to be consistent with men’s pay. For a marketing manager’s job in the Boston area you should use the $114K salary which is at the 75% mark on the salary graph as a goal for your negotiations. That number will help you stay above the 50% point which should always be the goal when negotiating. There is more research needed but this is a great first step to knowing if a job offer is equitable. More to come in future posts. This entry was posted on March 15, 2011 by Katie Donovan in Equal Pay, Job Research, Women Negotiating and tagged job research, salary research, total compensation.